Announcement NEW! Free U.S. shipping on microbes, and reduced cost international shipping! 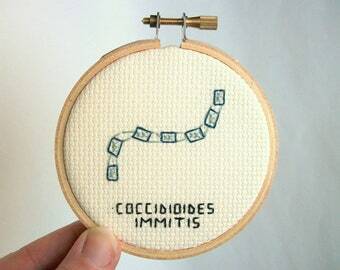 Domestic shipping costs are now included in the price of the microbe cross stitches; please use listings for multiple microbes to save money if you're buying more than one microbe! PLEASE NOTE: DOUBLE CHECK YOUR ADDRESS when you check out. Check the email you get from Etsy confirming your order as well, to be sure your order is being sent to the right place. I don't offer refunds to items delivered to an old address. 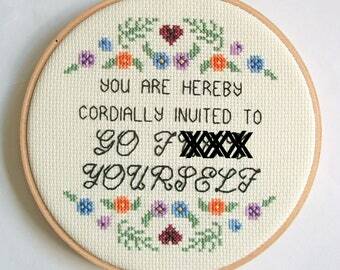 Welcome to the cross stitchery! There are other Wall and off-the-wall Stuffs coming, but for now, revel in the multicolored threads and the simultaneously ironic and earnest needlework of what I've got here. REVEL IN THEM. Especially during the holiday season, if you've convo'd me and I don't get back to you right away, please read the entire listing you had questions about or look over my shop in general -- you may find an answer to your questions there! Please forgive my lateness in responding to you, and please do feel free to write again if I haven't replied in my usual time frame to pop your convo back to the top of my inbox. I promise that I want to respond to everyone, and I apologize for any delays. I'll be prioritizing answering questions that aren't already answered in my listings, shop policies, or shop in general. Alrighty. Back to the stitching. NEW! Free U.S. shipping on microbes, and reduced cost international shipping! 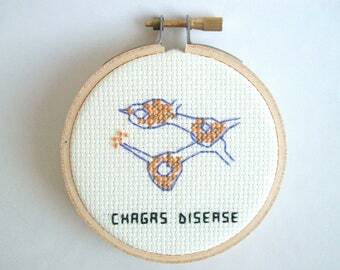 Domestic shipping costs are now included in the price of the microbe cross stitches; please use listings for multiple microbes to save money if you're buying more than one microbe! Easy pattern to follow. Did it in an afternoon for a friend of mine. I can't wait to make this hide it inside the door of my medicine cabinet. Haha. I like turtles. 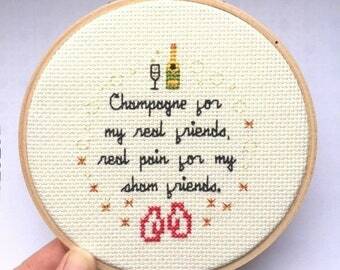 I mean, cross stitch. 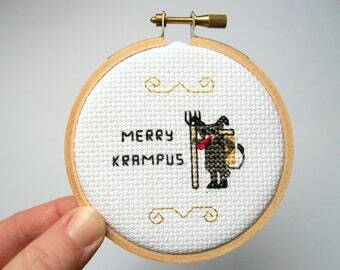 When it comes to cross stitch, I ask two standard questions: is the design funny or unique in the context of historical craft? And does it also earnestly incorporate the things we love now into that history? 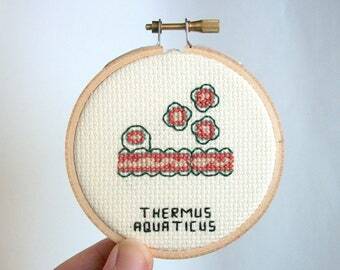 I stitch things that answer those questions in ways that I find interesting. 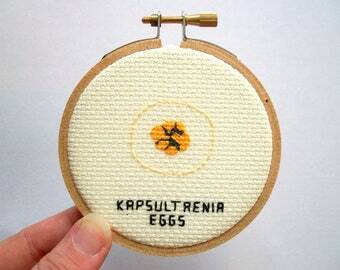 In my shop you'll find rude/sarcastic stereotypically-un-feminine sayings, science-focused projects like the microbe collection I've been adding to since 2012, or meme-based images that make the ephemeral internet culture we live in slightly more...phemeral? I occasionally teach local classes in basic cross stitch, really enjoy selling my wares at the monthly Love Local market hosted by Get Baked -- a bakery in Windsor CT with dangerously tasty food items -- and in general spend most of my days walking around with stray thread stuck to some portion of my sleeve. Away from the shop, I give my stitching fingers a rest and stay busy creating by working on a short-episode, mostly scripted podcast, called Nihilist Podcast Network (found anywhere podcasts are found, and also at its own website), with my husband and friends. In 2015, my husband and I also completed a year-long writing/music project called Paulicia's Weekly Whatnot, which you can find on Facebook or youtube (for just the music), or probably just by Googling. I'm weird, and I like weird stuff. Probably just like you do. I have a M.A. in watching TV (for real). In my free time, I listen to one jillion podcasts and write/work on the Nihilist Podcast Network (real podcast, fake network) with my husband. Please forgive my lateness in responding to you if I don't get back to you within that time frame, and please do feel free to write again if I haven't replied within a few days, to bump your convo up to the top of my inbox. I promise that I want to respond to everyone, and I apologize for the delays. Unless specified otherwise in the item description (which it usually is), I strive to get my items out into the mail within 2 weeks of your order. If you need something sooner, let me know -- preferably before you make a purchase, if there's a deadline coming up quickly -- and we'll see what we can do. The "Ready to Ship" section of my shop is perfect for last minute gifts! In cases of a general backlog, I'll make a note in my banner and shop announcements (below the banner), and here in the shop policies, or I'll put a note in the purchase confirmation sent by Etsy, or contact you to let you know the expected time of shipping for the item you've purchased via Etsy convos. During the holidays, I will make every effort to update my shop policies and announcements to reflect longer shipping times when they're necessary so you know exactly when items should arrive before you purchase. In general, it's a good idea to order any item you want to have for Christmas gift-giving as early as possible, preferably by December 1. PLEASE NOTE: DOUBLE CHECK YOUR ADDRESS when you check out. Check the email you get from Etsy confirming your order as well, to be sure your order is being sent to the right place. I don't offer refunds to items delivered to an old address, and several customers have contacted me to say that although they entered the correct address at checkout, the information that I ultimately received was an address where they hadn't lived for several years. If your item does not arrive, or arrives damaged, please contact me. I cannot replace broken frames, and because the price of my items is the same with or without framing (it's optional and free! ), broken frames will not receive a refund. Because needlework is best shown without being smushed up against glass, and because of the fragility of glass in transit, glass will not be included in the larger framed cross stitches. Please request that your stitch be sent either mounted or plain on cloth if this is unacceptable. If the needlework itself arrives irreversibly damaged, please be willing to take a photo that shows the damage. If you asked for insurance on your shipment, I will replace the needlework (with an identical piece) as soon as possible. If the item was uninsured, we can come up with a case-by-case solution, but I cannot guarantee a replacement in every case. Replacements will be shipped without a frame except in cases of wood embroidery hoops. Payment for shipped items will only be refunded in extreme circumstances. If you find you need to cancel a made-to-order item, and I have not yet started working on it (which usually happens a few hours after I receive the order! So be quick), I will refund you the full price minus fees (listing and Etsy fee). This is also my policy for already made items that have not been shipped. If you've ordered a custom order that cannot be sold in my shop, and you'd like to cancel your order, contact me so we can discuss details. Orders that have already shipped cannot be cancelled or refunded without clear communication between you, the buyer, and me, the seller; expect to return the item at your own expense and have the cost of shipping and relevant listing fees deducted from your refund, please. I pay sales tax only on items sold to other Connecticut residents; if you are living outside CT, please consult your state's tax laws to determine whether you owe use tax to your state for items purchased from my shop. For the convenience of other CT residents, sales tax will be added to your purchase price at the time you order. This means your sales taxes are taken care of, and you do not need to include your purchase when accounting for "use tax" at year's end. I send items out via USPS, usually first class and with tracking. I also now offer free U.S. shipping on microbes, and reduced cost international shipping! 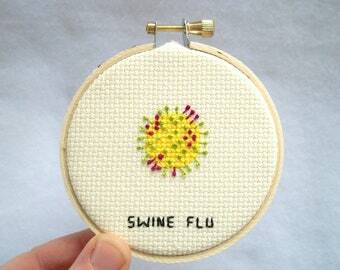 Domestic shipping costs are included in the price of the microbe cross stitches; please use the listings for multiple microbes to save money if you're buying more than one microbe! PLEASE DOUBLE CHECK YOUR ADDRESS. NOTE to UK CUSTOMERS: If your total order is valued above approximately $20 USD, please know that based on my experience, you have about a 50/50 chance of having your package stuck in customs in your country and waiting for you to pay a fee that will probably be NO LESS THAN £11. This will include a holding/processing fee of £8 plus the actual customs tax. For some reason, you will probably NOT be informed that your item is being held in customs, but if you see your package listed as "delivered" according to Etsy's tracking number and the USPS, it's very likely that customs is holding your package. I recommend you check with your local post office or customs office to try to locate your package; I can't do anything helpful for you from here. If you choose not to pay the fee, your package will probably get sent back to me after a few weeks. When I receive it back, my current policy is to refund the cost of the item (unless it is in any way a custom item), but not the cost of shipping, since it was shipped and did incur that cost. Contact me for details if this happens. Please consider these facts before purchasing anything from my shop. By purchasing anything from my shop, you are agreeing to your country's customs laws and these shop policies. International Buyers in general: Please note that import duties, taxes, and charges are not included in the item price or shipping cost. These charges are the buyer's responsibility. Please check with your country's customs office to determine what these additional costs will be prior to buying. I will not lie on customs forms, so please don't ask. Penalties for lying on a customs form are severe -- and sure, there's plenty of time to cross stitch in jail, but I'm pretty sure they wouldn't let me bring a needle in there anyway. If the item never arrives according to the tracking number you will receive in a shipping confirmation email (directly from Etsy to the email address you have on file with the site), please contact me so we can discuss next steps. If you would like insurance, PLEASE LET ME KNOW and I will invoice you for the additional shipping amount. I do not automatically include insurance in my shipping rates for most items because it adds cost. I will sometimes insure higher priced items, which will be reflected in slightly higher shipping charges. When the item is 5x7 or larger, Priority mail or Priority flat rate are occasionally cheaper, and in that case, your items will be sent priority. In rare cases, I may ship larger pieces with heavier frames parcel post. Framed cross stitches will be wrapped in clean paper and sent in either a yellow envelope or (if relevant) a box, unless you request otherwise. Glass will not be included in the frames, and refunds are not available for frames, which are secondhand and free to you. For international shipments outside the U.S., 4x6 or larger cross stitch pieces will be sent without a frame. The cost of shipping a secondhand frame is prohibitive, and it's very likely you can purchase a better frame in your local area for less. Instead, the stitch will be sent to you ready to frame yourself, mounted on a self-stick mounting board. Please convo me with your preferred dimensions if your area uses standard framing measurements that do not rely on inches, and I will cut the board to your standard. Unless specified otherwise in the listing, the frames I use, especially with 4x6 and 5x7 cross stitches, are secondhand and will vary from item to item. I believe in this policy because it's eco-friendly, supports the local thrift shops in my area, and it allows me to frame your items, if you'd like that, at very low cost. I do not frame finished work that is 8x10 or larger except in special circumstances when I have been convo'ed in advance of an order. I cannot send you a photo of your options for any secondhand framing sizes in my shop; I have too many frames and a too quickly rotating stock for that. However, you're welcome to let me know your preferences in color and material (i.e. wood, metal, plastic) and I'll do what I can to accommodate your wishes. When you order an item from me, rest assured that you are only paying for the stitchwork (plus other relevant materials), and you may treat the frame as a "suggestion" -- if you don't like it, give the frame away! Your 4x6 or larger cross stitch will come with a mounting board that will allow you to easily pop it out of the "suggested" frame I've sent it in and into any same-sized frame of your choice. 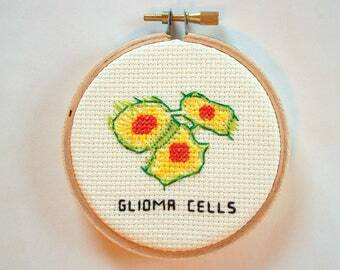 Again, because needlework is best shown without being smushed up against glass, and because of the fragility of glass in transit, glass will not be included in 3x5 or larger framed cross stitches and often left out of mini frames as well. Please request that your stitch be sent either mounted or plain on cloth if this is unacceptable. AGAIN, NOTE to UK CUSTOMERS: If your total order is valued above approximately $20 USD, please know that based on my experience, you have about a 50/50 chance of having your package stuck in customs in your country and waiting for you to pay a fee that will probably be NO LESS THAN £11. This will include a holding/processing fee of £8 plus the actual customs tax. For some reason, you will probably NOT be informed that your item is being held in customs, but if you see your package listed as "delivered" according to Etsy's tracking number and the USPS, it's very likely that customs is holding your package. I recommend you check with your local post office or customs office to try to locate your package; I can't do anything helpful for you from here. If you choose not to pay the fee, your package will probably get sent back to me after a few weeks. When I receive it back, my current policy is to refund the cost of the item (unless it is in any way a custom item), but not the cost of shipping, since it was shipped and did incur that cost. Please consider these facts before purchasing anything from my shop. By purchasing anything over about $20 USD, you are agreeing to your country's customs laws and these shop policies. I love to do custom work during the non-holiday months! I try to work on one custom project at a time so that I can give each project my full customizing attention; as a result, a significant lead time on deadlines for receiving your custom order is very much appreciated. Most of my small finished cross stitches have an option for gift wrapping. If you don't see a drop-down list as you purchase a small hooped or framed cross stitch (smaller than 4x6), but you would like your item to be wrapped in plain paper (with a small notecard for your message included), request gift wrap as you check out in the "notes to seller"! Etsy has a "this is a gift!" option that helps you tell me not to include a receipt -- I don't anyway! -- but I do not gift-wrap large items or kits. Mini kits are available for wholesale ordering at any time; contact me for details on which kits I have available with shelf-ready labeling, and for pricing details! I don't like my secondhand frame! It's ugly/broken/scratched/the wrong color/not my style. What can you do to help me out? I believe in using secondhand frames because it's eco-friendly, supports my local thrift shops, and allows me to frame your items, if you'd like that, at very low cost. Because they are unique and unapproved by you, I don't pass on the cost of the secondhand frames to you, except for the cost of shipping (usually about a $2 difference). When you order an item from me, rest assured that you are only paying for the stitchwork, and you may treat the frame as a "suggestion" -- if you don't like it, give the frame away! Your 4x6 or larger cross stitch will come with a mounting board that will allow you to easily pop it out of the "suggested" frame I've sent it in and into any same-sized frame of your choice. Can I see a photo of the secondhand frame you would send before I order/before you send an item framed in a secondhand frame? I can't send you a photo of your options for secondhand frames; I have too many frames and a too quickly rotating stock for that. However, you're welcome to let me know your preferences in color and material (i.e. wood, metal, plastic) and I'll do what I can to accommodate your wishes. If you receive your stitchwork and you HATE the frame I chose from my cache of secondhand frames, never fear! The stitching for a 4x6 or larger frame will be mounted on a board that you can simply pop out of the secondhand frame you received, and pop INto a frame you choose from a local store, another Etsy seller, or anywhere you find perfect frames. Because the secondhand frames I send are free, I cannot offer replacements or frame-related refunds. 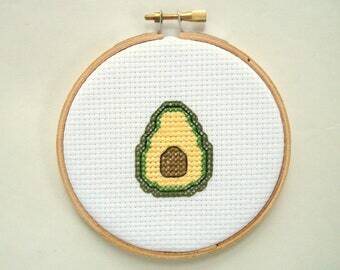 How do I learn to do counted cross stitch? Do your kits include fabric with the pattern already stamped on it? Nope! What I sell are patterns and kits for original counted cross stitch designs, which means you'll be using a printed pattern (or your computer screen if you prefer -- being able to zoom in on a detail can be very helpful! ), almost the way you would use a map to navigate in a city. The details of what is included in each of my kits can be found in the listing for that kit. Click "read more" under the pics for details. If you've never tried counted cross stitch before, many of my patterns are beginner-friendly, and I'm happy to say that many first-time stitchers have reported fun and success with my kits. 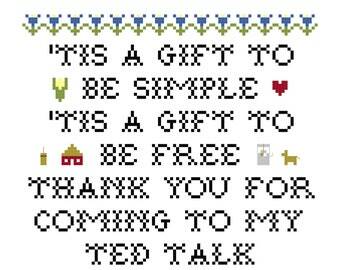 I'm also happy to send you a Basic Cross Stitch instruction book via email. Just let me know you'd like one, and I'll send it along! Are you going on vacation from May 12-19, 2018? *I will be unavailable for replying to convos during that week. Feel free to write to me anyway and I'll do my best to get back to you when I return! *I will email patterns that should be emailed after I return. Instantly downloadable patterns will still be instantly downloadable! *I will mail out kits within 3 days of my return unless that's impossible for some reason (i.e. my apartment burns down and also all the local craft stores burn down). *Please add one week to the regular shipping estimate shown in the SHIPPING section of each listing for any item that usually ships within 1-2 weeks. *I will do my best to be on time with items that have a 3-4 week shipping time.